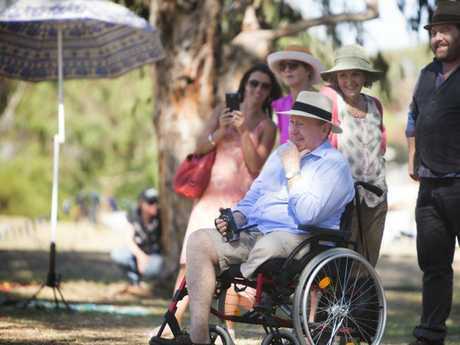 Australian actor Tony Barry has only one leg. 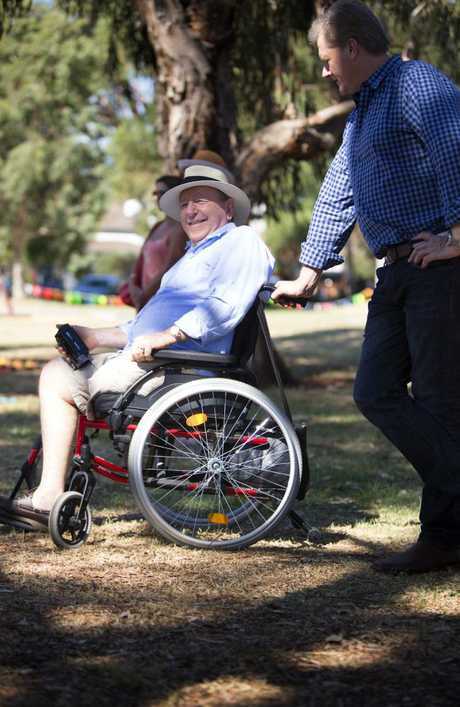 In May 2013, he was rushed to hospital in Brisbane after a huge melanoma on his lower left leg burst open, leading surgeons to amputate the leg above the knee. He is now in a wheelchair. 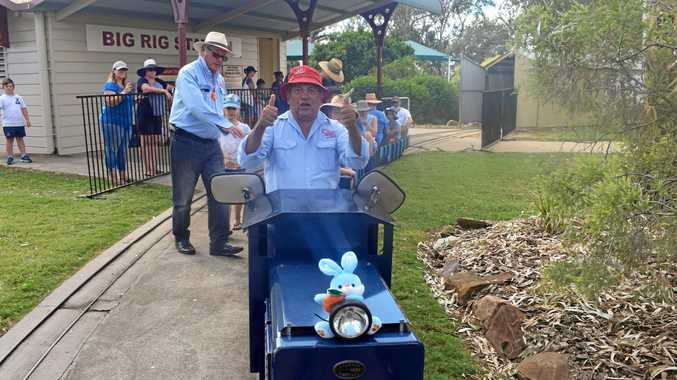 The 77-year-old has worked as an actor for years, starring in a staggering 56 films and 45 television series, including the ABC drama The Time Of Our Lives. But most recently Mr Barry has become infamous in some corners of the internet for his devotion to a dangerous alternative cancer treatment called black salve. The dark topical paste burns and destroys skin tissue, often leaving behind a large scar. It contains zinc chloride, a toxic dehydrating agent and skin irritant, and the plant blood root. Tubs of black salve can be purchased online from domestic or international vendors and in person from underground sellers at their homes or local natural markets. Black salve is banned in Australia and it's illegal to supply, sell or import. But unlike illicit drugs, it's not illegal to possess the ointment. Fans of black salve say it's a quick, easy and natural way to treat skin cancers. Doctors, dermatologists and the Therapeutic Goods Administration (TGA) say it's dangerous and deadly. A TGA spokeswoman said there is no "credible, scientific evidence" that black salve can cure or treat cancer. "Black salve products can destroy large parts of the skin and underlying tissue, and leave significant scarring. The TGA strongly advises consumers against purchasing or using these products," the spokeswoman told news.com.au. A qualified medical professional should always be consulted for the diagnosis and treatment of skin cancer, said Cancer Council Austraila CEO, Professor Sanchia Aranda. "Black salve is a corrosive substance that burns off layers of skin and surrounding tissue and there is no evidence that it is effective in treating skin cancer. The treatment has been shown to have severe adverse effects including destroying large chunks of skin and leaving heavy scarring," Professor Aranda said. "Surgery or a medically proven cream offers a far better chance of getting rid of the skin cancer without damaging surrounding skin." Mr Barry's leg was amputated after years of applying black salve. He has used it on hundreds of melanomas, rejecting advice from doctors to undergo chemotherapy and radiation. 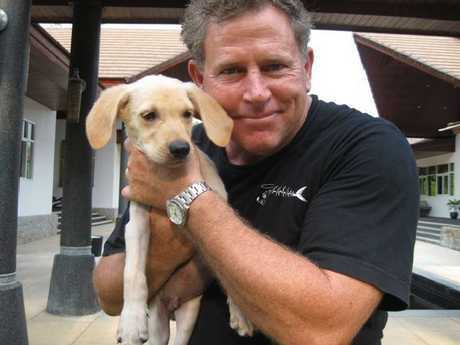 The producers of The Time Of Our Lives changed the storyline of Mr Barry's character Ray to accommodate the amputation - Ray had an accident while changing a car tyre in season two. Tony Barry as Ray in The Time of Our Lives. 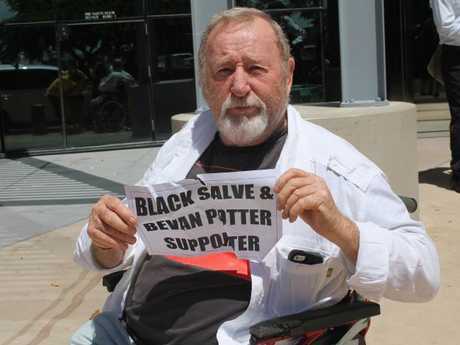 In 2015, Mr Barry was one of about 25 people who turned up to a Gold Coast court to support Bevan Potter, a local man who was charged with importing black salve. 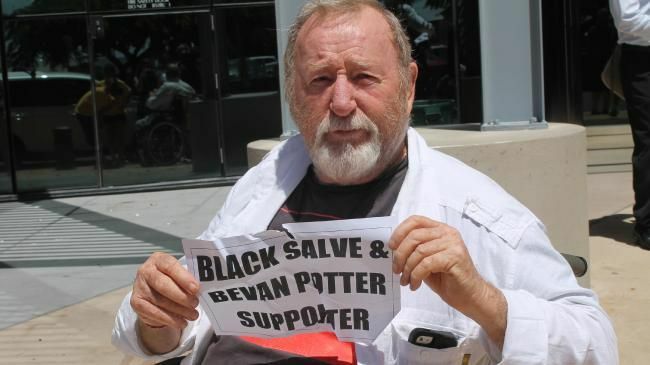 Mr Barry was photographed in his wheelchair outside the court holding a sign that read, "Black Salve & Bevan Potter supporter". 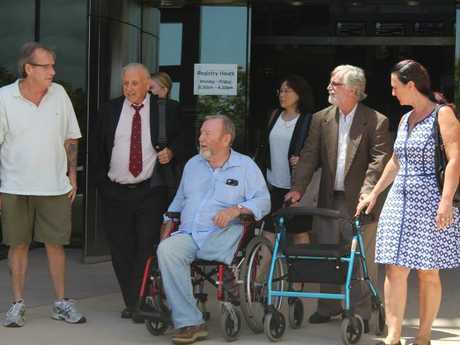 The court heard Mr Potter, 74, made more than $100,000 in gross profit from his illegal business. He pleaded guilty to 24 counts of importing a substance for use in humans and was placed on a good behaviour bond. His stock of black salve was later seized by the TGA and his online store shut down. Mr Barry, like many who use black salve, believes mainstream doctors and scientists are not acting in the best interests of patients. Rather, they are prescribing expensive medical treatments purely for their own benefit, part of a "money making machine" profiting off the public "in the name of science", he said. This opinion is widely held among black salve fans. They claim the cheap ointment at $50 a tub has the potential to destroy the billion dollar "cancer industry" run by traditional health care providers. They don't care about the warnings from doctors. They believe most health professionals only criticise black salve because they are frightened the illegal treatment is a threat to the medical industry's profits. But the list of people who have died or been severely maimed after using black salve is alarming. This 55-year-old Queensland man was left with a hole in his head after using black salve. Queensland man Ian Booth died of cancer in 2016, after former chiropractor George Zaphir told Mr Booth he could "cure" his cancer by applying black salve and having weekly injection of high doses of vitamin C. When he died, Mr Booth's tumour covered more than half his face. In February Mr Zaphir was charged with six offences in relation to the unlawful use of the title chiropractor and pretending to be a qualified medical professional. Helen Lawson was a respected emergency department nurse and keen cyclist who died in April from ovarian cancer. She shunned mainstream cancer treatment and used black salve on her stomach, which eventually ate away at the flesh on her abdomen. Despite repeated attempts by her family to seek help, Ms Lawson refused. Eventually she was rushed to hospital after collapsing at home and died that night. 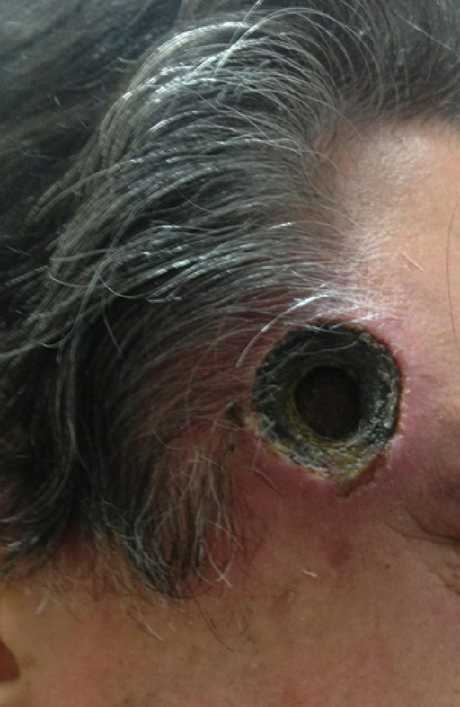 In 2014 a 55-year-old Queensland man was left with an inch-wide hole in his head after applying black salve to a lesion he believed was cancerous. He applied black salve to his right temple for about four months and eventually took himself to Brisbane's Princess Alexandra Emergency Department for treatment. It's believed he is still alive. Brisbane dermatologist Dr Erin McMeniman, a fellow of the Australasian College of Dermatologists, has treated "about 20-30" patients who have used black salve. Dr McMeniman accepts that many people want to try alternative health treatments, but wishes they would do so with the assistance of a doctor. "I'm not against people using alternative treatments. I just want black salve to be regulated and for it to be safe," Dr McMeniman said. "I've offered patients a biopsy to prove that the affected area is a lesion. I said if they want to use black salve, I would support them through it. But they are all very secretive and just refuse. I have a series of patients who used it and it killed the whole layer of skin. They get a big blister or scab and it peels the top skin off," she said. "That's fine if the lesion is superficial or benign, but if it's deep there will be roots that are not killed and they will grow deep and metastasise"
Black salve can be deadly if used on deep, advanced cancers. "A colleague of mine treated a woman in her 20s who used (black salve) on a melanoma on her thigh and it metastasised and she died. It will burn whatever it touches. "One woman I treated ended up in emergency because she used black salve on a birthmark she had since she was a child. She burned this massive hole on the side of her abdomen getting rid of what was a benign birth mark that had been there her whole life. It's bizarre." The craziest thing about all of the black salve fans she has encountered is that they continue to back the treatment, even if it has caused them serious damage. "They can't see any wrong and are so strongly attached it. That woman with the birthmark, she wasn't that critical of black slave. She said 'Obviously I used too much, it's my fault'. It is a real danger and I worry that more patients will use it," she said. 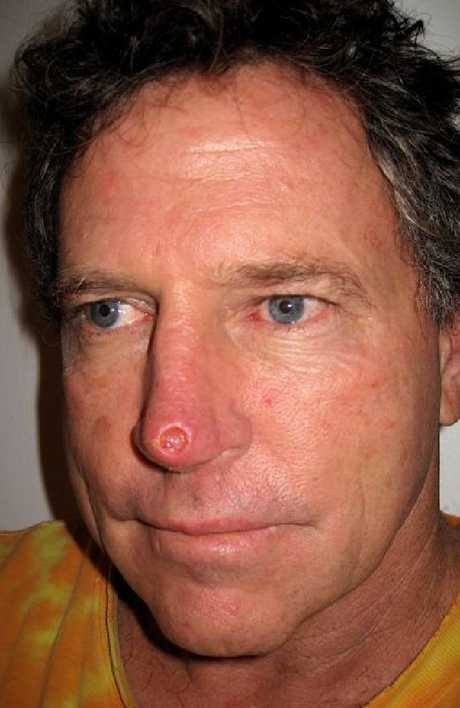 Queensland man Bill O'Leary claims to have successfully used black salve "about 20 times" on skin cancers, including on his nose, and has made some of the ointment for himself. 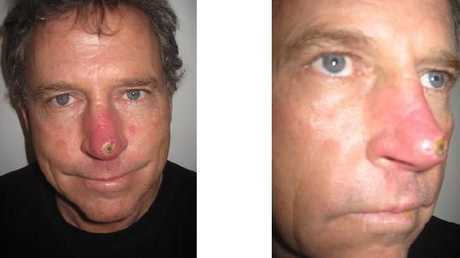 He refused to take the advice of doctors and undergo surgery on his nose. "The surgeon said he would mark out the exact cancer and then he would cut around it to make sure he got it all. They were going to cut out a piece of my ear and put it on my nose," Mr O'Leary said. Why didn't he take the doctor's advice? "I just didn't trust the system." he said. 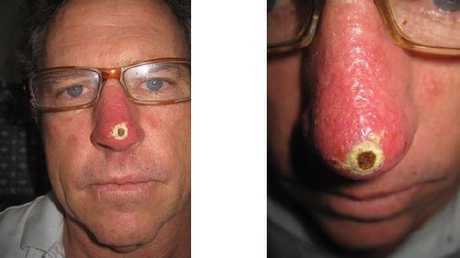 Instead, he used a "big dollop" of black salve on his nose and watched as it burned a small hole into his skin. "Black salve is like nature's scalpel and it was really scary," he said. This is what black salve looks like when applied on the skin. 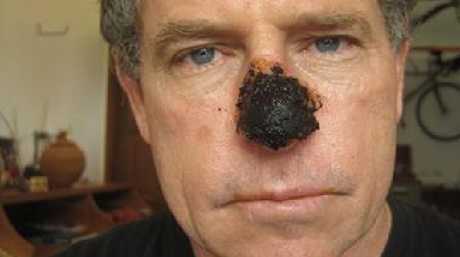 Bill O'Leary's nose after applying black salve. But over the course of a month, the small hole in his nose healed. He has a small scar, but it's mostly unnoticeable. Bill was left with a small crevice in his nose. Bill after using black salve on his nose. Like dermatologist Dr McMeniman, Mr O'Leary wants black salve to be regulated by the TGA. He says it's a "lack of regulation and lack of experience" that cause harm, not the product itself. "I've seen some guy smother it all over his face like Vegemite. There should be standards and guidelines so people know how to use it properly," he said. The opinions of doctors and experts don't matter to him. When asked if he was worried about using a product backed up by no scientific evidence, Mr O'Leary just laughed. "Well what's my nose if it's not evidence? It works." Mr Barry declined news.com.au's request for an interview. Tony Barry as Ray, undergoing physiotherapy in The Time of Our Lives.